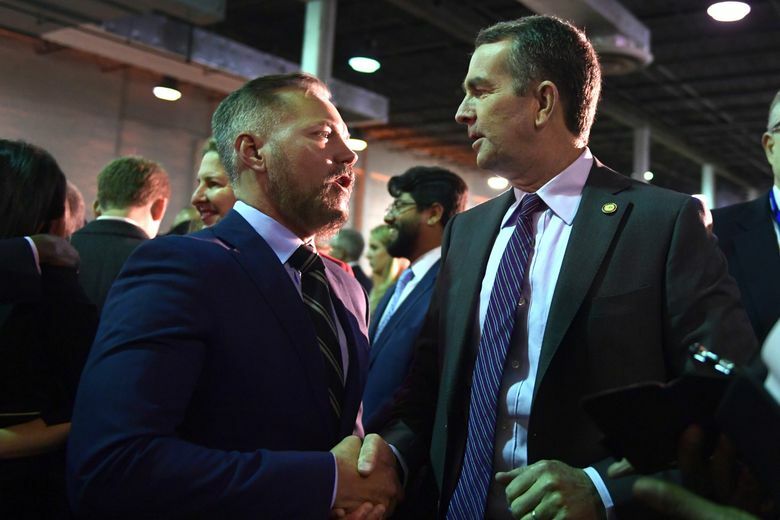 The company's headquarters expansion will be in Arlington County, Virginia, and the Long Island City neighborhood of New York, and Nashville will get a 5,000 person satellite office. After a year of searching far and wide for a second home, Amazon decided to place its new headquarters sites in the nation’s capital and its largest city, setting the stage for a shift in the retailer’s center of gravity from its Seattle home to the East Coast. Amazon on Tuesday made official what leaks had suggested for a week: Arlington County, Virginia, and the Long Island City neighborhood of New York had won the sweepstakes for what initially was called HQ2. The retail and technology giant had originally billed its second headquarters project as a single site, and pledged to spend $5 billion on a corporate campus that would grow to 50,000 workers. That forecast, the largest economic-development project in a generation, may prove too small for Amazon’s ever-growing ambitions. The company, which currently employs more than 610,000 people worldwide, said Tuesday that it plans to staff each of its new outposts with about 25,000 workers spread across 4 million square feet of office space, with an option to double that square footage sometime in the future. Jay Carney, who oversees the company’s public relations and government affairs work, called the 25,000 figure “a floor for each” city. “It can and will grow beyond that,” he said in an interview. 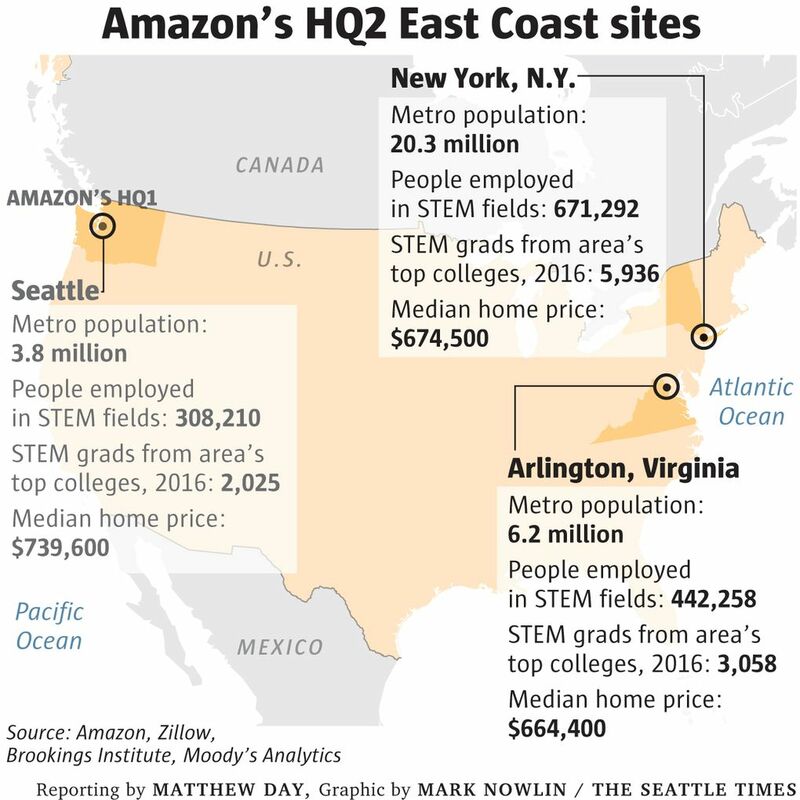 Even before Tuesday’s announcement, the Washington, D.C., and New York metropolitan areas were home to Amazon’s biggest satellite offices east of the Mississippi. Herndon, Virginia, is the East Coast headquarters of the Amazon Web Services cloud-computing division, part of a 2,500-person contingent in the area. New York is home to expanding teams focusing on advertising and book publishing, and earlier this year had some 1,800 Amazon employees. The two regions are also among the few in the United States that boast more workers employed in science, technology, engineering and mathematics occupations than Seattle. Amazon said access to skilled recruits was the driving factor in its decision. Amazon’s new development sites are located in neighborhoods that sit on spokes of each city’s transit system, across the river from the central business district, and a short distance to airports — Reagan National in Virginia and LaGuardia in New York. The company didn’t say what the employees hired to staff its new offices would be working on. Splitting corporate command and control functions among multiple headquarters would be an unusual move, and outside observers speculate that the company may, at some point, choose to locate specific business units in each city, or spur that change by relocating a top executive. Many observers say Amazon’s headquarters, will — by default — be wherever Chief Executive Jeff Bezos and his top lieutenants spend the bulk of their time. Amazon’s existing corporate structure has three titular chief executives. Reporting to Bezos is Jeff Wilke, who runs Amazon’s retail and logistics business, and Andy Jassy, chief of Amazon Web Services. Carney — who lives in the Washington, D.C. area, and flies regularly to Seattle for meetings of the top brass, known internally as the S-team — said the company didn’t currently have plans to transfer top executives or business units. Eventually, he said growth in each city will bring “leaders from business teams across the company,” and workers plugging away on a variety of units. The company expects to hold events like board of directors meetings and shareholder functions among the three headquarters cities. Of course, plenty of companies — Amazon included — have taken those corporate staples on the road without a multiple-headquarters structure. Amazon says its rank-and-file employees may apply for a job at one of the new headquarters sites through the internal protocol that governs relocation among the company’s existing satellite offices. Victoria, a young Amazon employee who spoke on the condition her last name not be used, said that while plenty of employees like her had made the move from the East Coast for an Amazon job, there were many more other recent graduates reluctant to make such a jump. Many Seattle employees, she guessed, might be interested in moving to one of the new headquarters. In the longer term, the company says, jobs may be listed at one, or multiple, Amazon headquarters locations and more numerous satellite offices. The online retailer added another outpost to that list, a surprise disclosed in the Tuesday blog post that announced Amazon’s headquarters selection. The company plans to open a 5,000-person satellite office in Nashville, Tennessee, one among the 20 regions on Amazon’s HQ2 shortlist. That outpost, the company said, will serve as an eastern hub for its logistics work. Two of Amazon’s most important partners in that business — and sometimes rivals — are in the same neighborhood: FedEx is based in Memphis and UPS makes its corporate home in Atlanta. Amazon’s own expanding air-cargo operations are located in northern Kentucky. Tax breaks and other government incentives to support Amazon’s projects in the three cities total at least $2.4 billion, according to the figures provided by Amazon. Delivery of much of that sum is contingent upon Amazon meeting hiring and investment targets. Nevertheless, the figure is likely to further fuel the debate Amazon stoked during its search about the wisdom of reaching into the public purse to subsidize real-estate decisions made by one of America’s biggest corporations. New York and D.C., which boast highly educated workforces, robust public transit and desirable cultural scenes, are not seen as cities that have to make up for a lack of amenities with cash. Some politicians in Amazon’s new homes were wary of the deals, negotiated in secret and under confidentiality agreements by top political and economic-development officials. 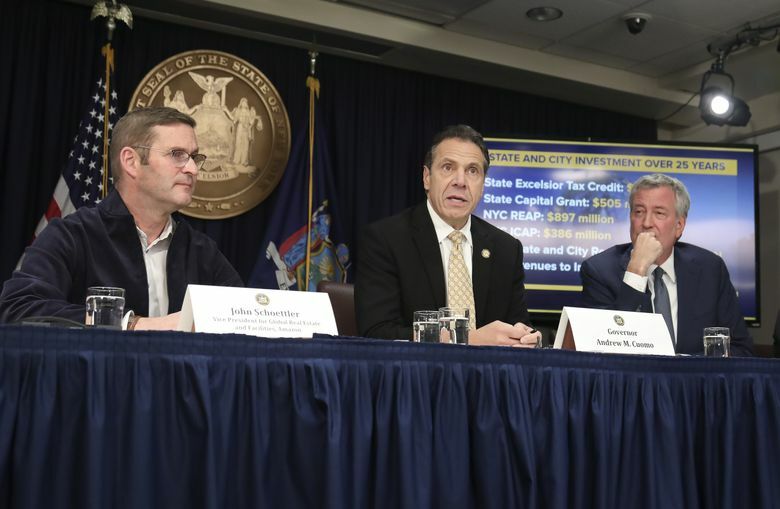 “With zero community input and nearly $2 billion in subsidies to a global behemoth, I am going to be skeptical,” New York City Council Speaker Corey Johnson said in a statement. Amazon, linked by its many critics in Seattle to the city’s traffic woes and housing-affordability crisis, may face similar strains as it develops in its new homes. The highways and back roads that cross Northern Virginia’s patchwork of suburbs are known for congestion. New York City’s subway system, meanwhile, is creaking under the strain of years of accumulated delays in maintenance and a growing ridership. 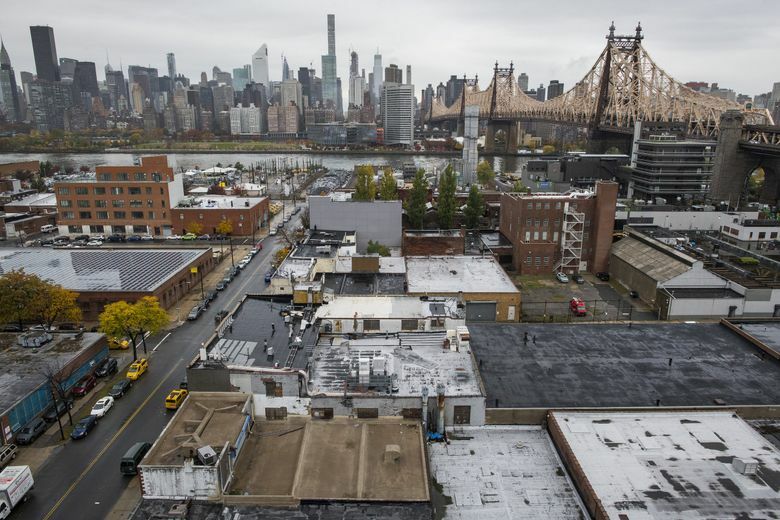 And while developers have fashioned Long Island City itself as a complex of high-rise apartments and corporate developments, it is adjacent to light manufacturing and predominantly immigrant communities vulnerable to displacement should the cost of living surge. Amazon’s plans project locating about 1,100 people between its two new headquarters sites in 2019, and then accelerating that growth. But the company placed a more immediate mark on one of its new homes, saying its D.C.-area expansion was located in a place called National Landing, a name that doesn’t appear on area maps and baffled area journalists, who know it as the Crystal City area of Arlington County, Virginia. The name came from JBG Smith, the owner of the property at the core of Amazon’s new campus there. It has sought to rebrand the neighborhood, which is characterized by high office-vacancy rates after the exit of some major government tenants and contractors. 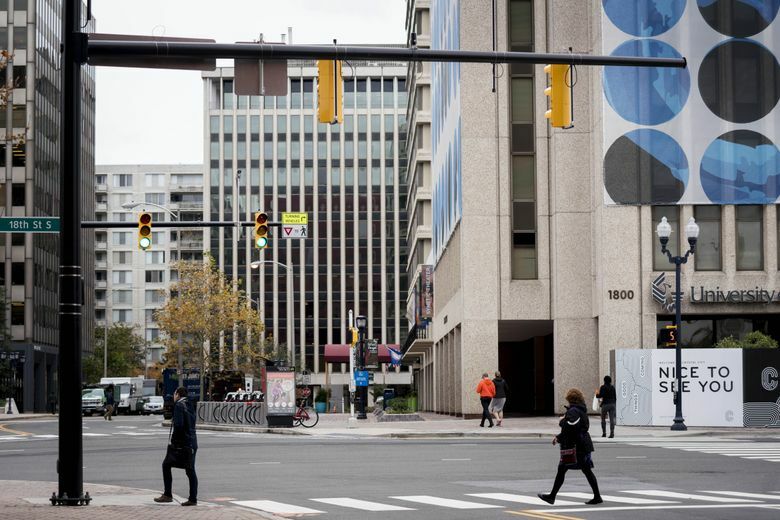 A website operated by the publicly traded real-estate firm said newly christened National Landing encompassed Crystal City, as well as portions of Pentagon City and Potomac Yard. “That’s what it’s called now,” Carney said. Seattle Times reporter Agueda Pacheco-Flores contributed to this article.